Mod The Sims - Teddy Bear Joint Assignments? Milkshape 3D - Teddy Bear Joint Assignments? Replies: 53 (Who? ), Viewed: 24445 times. Hi everybody! 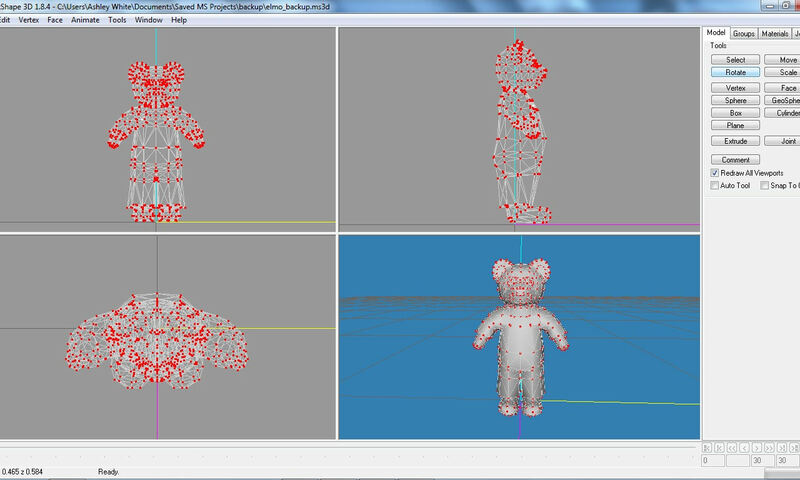 I'm trying to make a stuffed animal collection cloned from the teddy bear and despite assigning the correct joints to the proper vertices on the high and low mesh in MS3D, my object still disappears upon pressing "play" in Live mode. Sims2 Unimesh Bone Tool V4.09 solved the disappearing problem for my other objects, but not this one. Could it be that at this point the teddy bear is unclonable? I really don't want to settle this collection for deco-only items just yet. With wat proggy you made it? I'm using TSR Workshop. Should I use S3PE? No, just make sure you have the correct skeletons. Skeletons? I guess I don't understand what you mean by that. Is it totally different from joint assignment? How would I go about checking for that? eris3000, maybe you could make a clone and import it back into the game without altering anything. That way you can check wether that bear is cloneable or not before you do more work on it. As far as I can see from the pictures the assignment is OK, you did include all the joints that came with the object? Sometimes joints can have no vertices assigned, but are only used for animations etc. Ok, I re-imported the originals and they did not disappear. So it has to be my mesh. I don't understand what. I did export the original mesh and import it into MS, and made my new mesh from it, and assigned the joints from there. I didn't re-arrange anything and I even renamed my new group the name of the single group of the original (group_0). I've uploaded the work file if someone would like to take look. Sorry, cannot check your object now, but in this thread from EsmeraldaF, is information about a bed that disappears when used, this could be usefull for your disappearing toy? 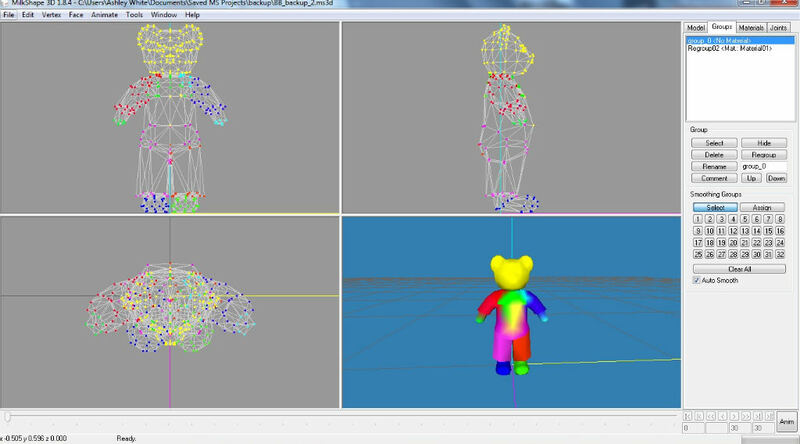 After looking at the attached wrk file I noticed a couple joints that looked to be assigned differently than the original teddy. Noticeably 0x736C32C2. In the original it appears to be assigned to the entire teddy and in yours just part of the body. The other was 0xAA25EED7. The original is the mid section included the outside seams and yours is just the very mid section. The other thing I noticed is your joint assignments are in a different order. I have no idea at this time how to change them. Wes made a note of out order joint assignments in another thread pertaining to obj tool. He mentioned reordering them for obj tool to read them in the correct order. TSRW doesn't have the same issue is what it sounds like but I'm really not positive on that one. I also notice there are color variations in the original teddy joints - ranging from green to red and I have no idea the significance of this. Last edited by HugeLunatic : 4th Jul 2010 at 3:18 PM. Thanks for replying! And yes, 0xAA25EED7, 0x3CF1BB96, and 0xA366C63D are tricky as they are all color-coded green. 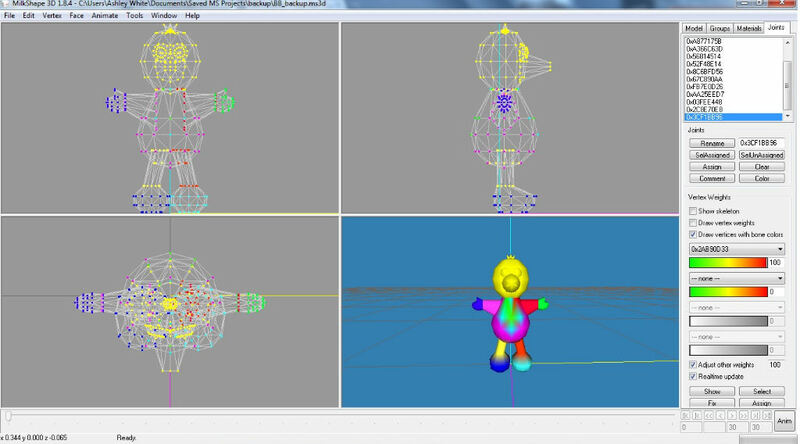 In MS, to attempt to assign the right joints to the right vertices going by the orig. 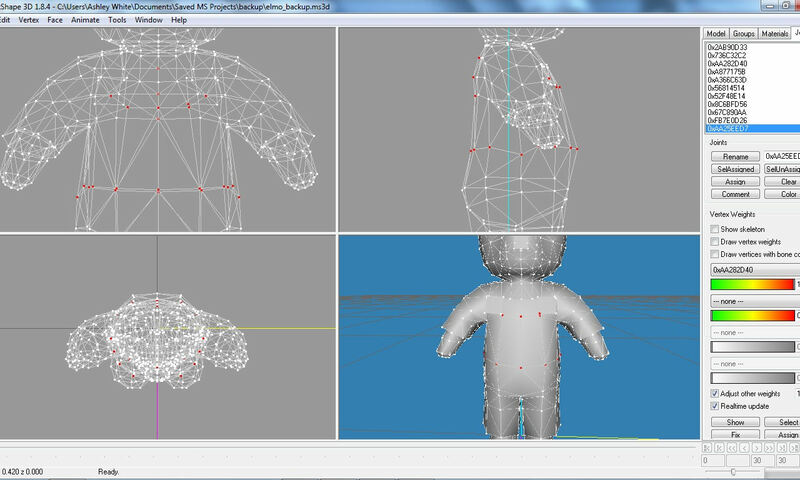 bear, I selected each vertices and clicked "show", under the joints tab, to see which joint is assigned there. As my mesh has a completely different shape and fewer vertices in the body area, I tried to get it as close as possible. 0xAA25EED7 has 3 joints assigned in the center of the chest area while 0xA366C63D is the left shoulder, down the back, and literally one joint in the chest, below and off to the left of the 3 assigned to 0xAA25EED7. 0x3CF1BB96 is the right hand. As for 0x736C32C2, I'm going to go back and tack a look at that because that was tricky too. 0x736C32C2, 0x8C6BFD56 and 0x736C32C2 are all color-coded magenta. I know 0x8C6BFD56 is the mostly assigned to the left arm. So I'm going to go back and look at that, as well as this "joint order thing". That I'm not understanding. Thanks for everyone's help, I'll check back! HugeLunatic, looking back at it, I see what you meant when you said 0x736C32C2 is assigned to the whole bear. Now the question is, how do I assign more than one joint to a vertices? Okay so I tried to do some reassigning and this time only tiny peace of the mesh did not disappear. I'm still not sure how to assign more than one joint to vertice though, but it looks like I'm making some progress. 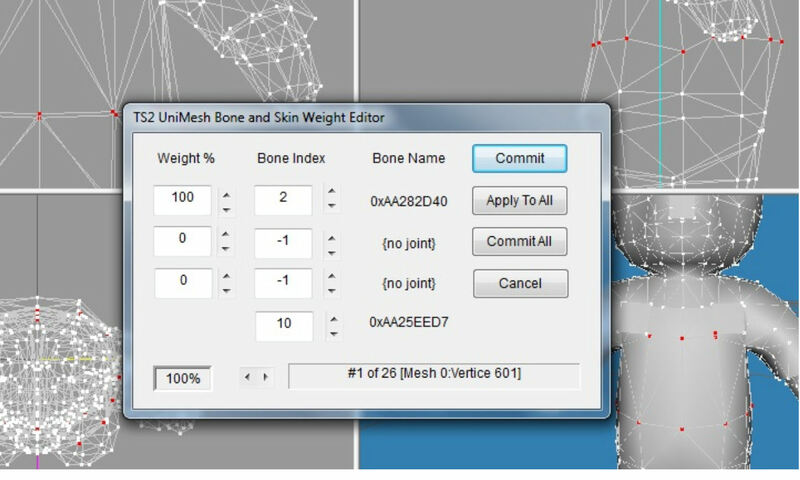 Like i said earlier, use Wes H his unimesh tool, lets you assigne 4 bones per vertex if needed. And if you have the original in the background(list it first in the groups tab) you can copy it boneassignements on to your custom mesh. Yeah I had that tool already. Just how does the layering go? * Open the BoneTool (in the Vertex menu). There are three boxes, from top to bottom, that have the weights for the first selected vertex in them, with the joint number and the name beside each one. * You can step forward and backward through your vertex selection with some arrow buttons. You can type new values in, or use the arrows to increase or decrease the weight. You can also step through the available bones to pick one different. * When you are through with a particular vertex, click on "commit" to keep your changes before moving to another vertex. When you are done with all, click on "Commit All" to save everything back to MilkShape. * You will see there is another button, "Apply to All", that is the most useful part. If you select just some vertices, you can set the boxes to the values you want and click on "Apply to All" and all of the selection will be set to those values. Follow that up with a "Commit All" and you will have assigned all of your selection to your new values quickly. * Cancel, of course, just closes the BoneTool without changing anything. So the trick is, make the right selections and use Apply to All to be the most efficient. 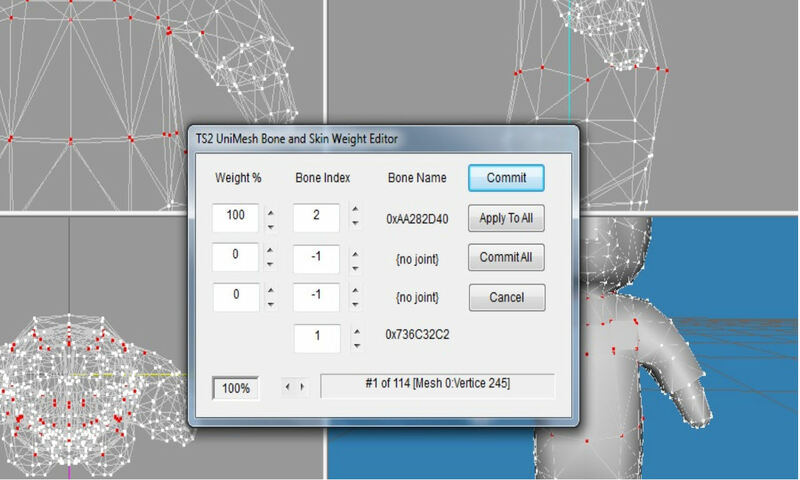 "Skinning", as this is called, is always a tedious part of modeling, but the quality of your final mesh will depend on doing it fairly well, because the game engine uses the weights and assignments to cause the skin to follow the bone movements. Having arm assignments on the belly, for example, will result in crazy behavior in game, but by assigning only 100% to joints will cause sharp bends, which do not look right on organic items. At a minimum, you want the vertices where the bends happen to be 50% one joint and 50% the other joint, which will add some "roundness" to the bend. I know that "0xAA25EED7" is not a memorable joint name (it is a hash value that was calculated from a name), but it is all that is automatically available when loading a Sims 3 object mesh. If you look in MilkShape, in the joints panel, you will see that you can select a joint and see in the viewports where that is on the model, which should give you a clue what the joint is for. Sadly, I do not have TSR Workshop installed on this machine, so I could not review your model for better advice. However, the meshing part of the model making process is generic, and the assignment process should work fine using the TSR plugins for export. Ok, joint 0x736C32C2 (magenta) is assigned to the entire mesh, kinda like in the background with all the other joints overlapping, so if I were to select any parts of the mesh and open up unimesh, it'll be listed in the fourth box. Now there are these two other joints that overlap the magenta one, as well as each other; 0xAA282D40(turquoise) and 0xAA25EED7(green). Actually, green overlaps turquoise, and looking at green in unimesh, it is listed in the fourth box where magenta was, with turquoise in the first box at 100%. 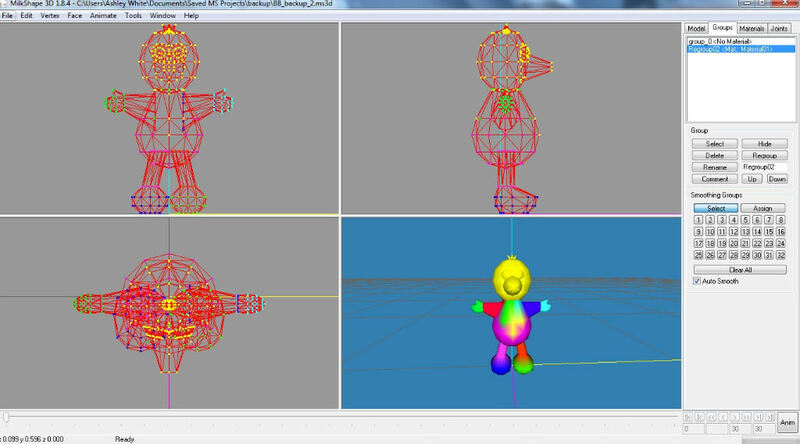 But, the color green is seen on top across the 3 vertices in the chest when "Draw vertices with bone color" is checked. Now around the waist, the magenta is on top, and in unimesh, the magenta joints are in both the first and fourth box, but green and turquoise are also assigned there as well. My confusion comes in on the part of trying to assign the joints just like that to my mesh. But when I try to overlap them, one is always dropped off somehow. I did try utilizing the other boxes in unimesh and playing around with the weights, but could never come up with the same results as the original. It really boils down to just these three joints that are giving me such a hard time. I also posted pics of what I'm trying to say. Thanks for everyone's help! Is this the sims 2 bear? Made a template that lets you convert a sims 2 mesh to sims 3, it fixes the bones. I remember the sims 2 bear was already assigned to bones when i once converted it to a toddler suit. This is the sims 3 bear. Okay, HugeLunatic was on it. Apparently Workshop makes a big booboo of the joints. The order is completely re-arranged within the program itself. I tried exporting the meshes from S3PE and the joints, and their assignments, were in a much more logical order; I re-assigned the whole mesh according to that order in MS, exported it in the WS format, and imported it into WS. As a test, I re-exported the mesh I just imported back out of WS, and all of the joint assignments were re-arranged. This did not happen due to the format change as I tested that by re-importing the meshes (in WS format) back into MS, w/o importing into WS. The order had not changed. With the joints being out of order like that, I don't think the teddy bear will be clone-able with WS, unless it's fixed. I'm currently in the process of trying to clone it with S3PE (if I can get the darn texture part right ). I'll write back to let every know if it worked or not. It sounds like they are not reindexing the assignments when the joint order is changed. They need to be managed like matched sets, change both or neither. But that should be transparent to a creator, a topic of interest mainly to programmers. If you like working with TSRW, you probably ought to post the problem with the two files on their site. If you provide them with a reproducible example, they will have an easier time fixing it. 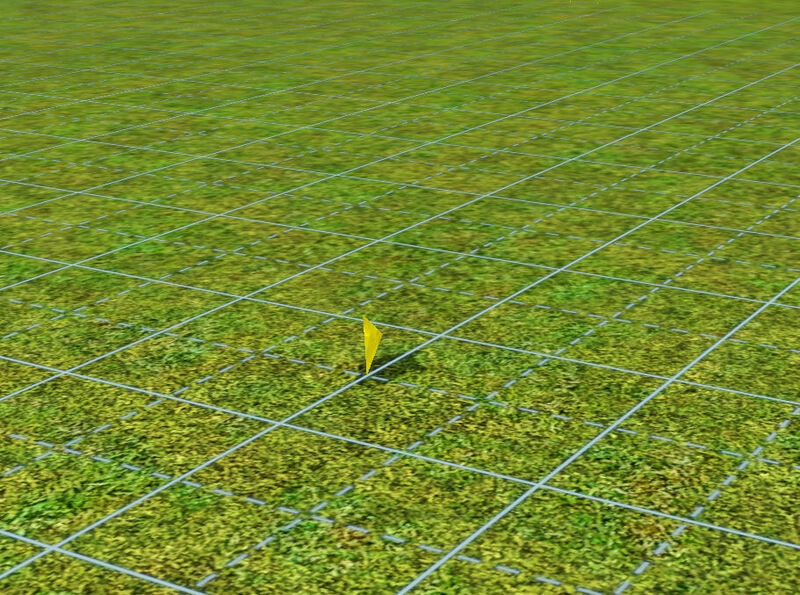 The majority of the Sims 3 objects have just a single joint, and single weighted assignments. This may not really be a known issue for them. Their importer/exporter doesn't support more then one bone per vertex on the bear. 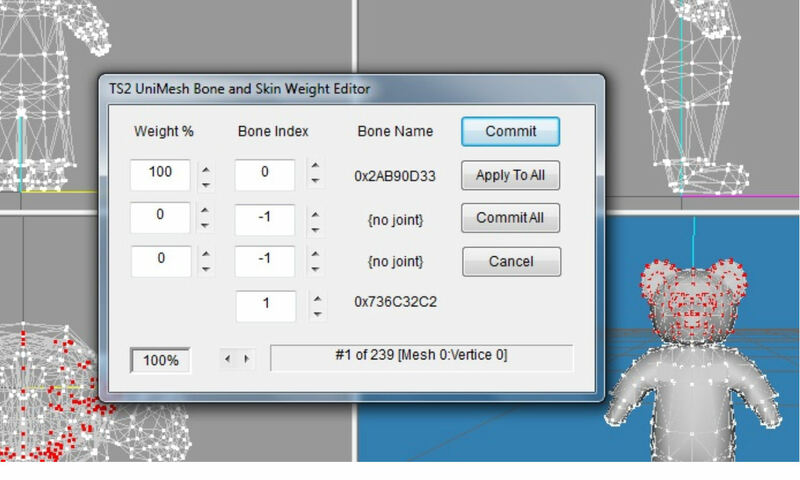 Prolly because there are not many objects with more then one bone per vertex. Already mentioned(TSR) that you cant mix and match both importers as both use a diffrent joint order on import. Same with the WSO and GEOM importer for the bodymeshes. you can however build the files with TSRW and later update the mesh with Postal or s3PE, its how i do it most of the times. Last edited by Base1980 : 8th Jul 2010 at 11:15 AM. Yeah, I was posting back and forth, here and there at the same time because I though the problem was MS. But I've mentioned it there. Thanks for everyone's help! edit, you can however build the files with TSRW and later update the mesh with Postal or s3PE, its how i do it most of the times. I currently don't understand what the problem is with the joints in TSRW, because my multiple assignments on the teddy worked, as well this whole body joint was kept on import/export. Did you reorder the joints within Milkshape, or did they already come in a different order than Workshop would provide it? If that's the case, I'm afraid TSRW is very strict when it comes to the ordering of groups/joints. when i opened the WSO file the mesh did have multiple boneassignements but i could not change them in any way.